If you were one of the audience members who put this dynamic group on your list of “must see again” after their amazing performance at last year’s Festival or if you missed that opportunity, your chance is coming up real soon. Tickets are available through Box of Delights Bookstore (call them or drop by the store). Tickets will also be available at the door. 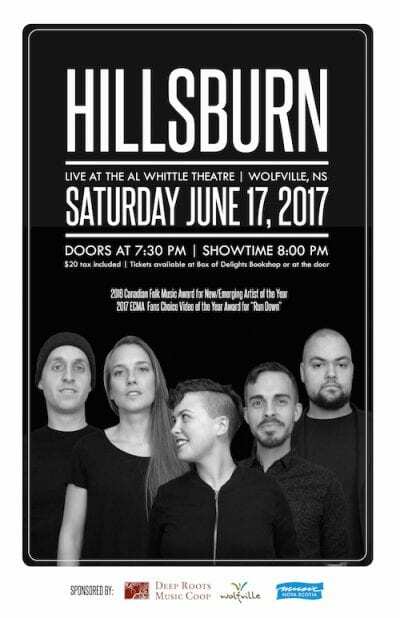 In December, 2016, Hillsburn won a Canadian Folk Music Award for New Emerging Artist of the Year and in April, at the ECMA’s in Saint John, their video for “Run Down” was awarded Fans’ Choice Video of the Year. Check out their website Hillsburn.com for full bio and to listen to their music. Their highly anticipated new album is expected some time this year.